Marine conservation projects in the Seychelles are plentiful, but Wildlife ACT offers a very affordable Seychelles ecotourism experience that allows you to contribute towards genuine island and marine conservation efforts. As a Seychelles volunteer or ecotourist, you will work directly with island conservation scientists and a dedicated research team. 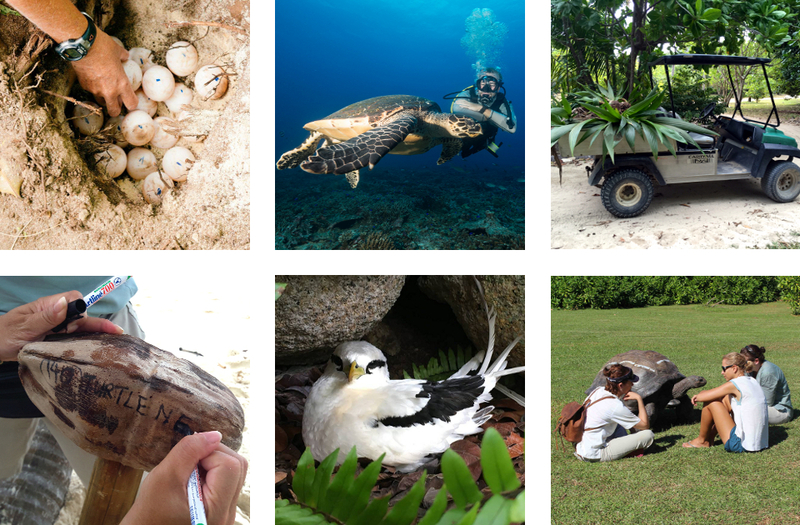 Our Seychelles volunteer project focuses on three key aspects: Endangered Species monitoring, Marine Conservation and Ecosystem Restoration. Wildlife ACT ecotourists get to experience land and marine conservation on an exclusive, private island called North Island. The project seeks those with a keen interest in tropical island conservation and ecology to get involved in all the activities of the Environmental Department from field work to data entry. Much of this data is providing a greater understanding of tropical island ecology, marine conservation, sea bird migration patterns, ocean temperatures and the impact of climate change. This Seychelles ecotourism project is also a shining example of the importance and effectiveness of island and marine conservation through ecotourism. Island wildlife and marine conservation of North Island is envisioned in the Noah’s Ark project, which aims to restore and rehabilitate North Island as a safe haven for endangered and critically endangered Seychelles flora and fauna. North Island’s ecologists and marine conservation experts have been restoring these native habitats for more than a decade, by removing invasive species and restoring the habitats of indigenous species. In 2017, North Island was named the National Geographic World Legacy Awards winner for conserving the Natural World. North Island as a whole comprises one of the most ambitious conservation projects ever undertaken by a private company. It is very seldom that the opportunity arises to make such a significant and positive impact on a region, a specific area, its wildlife and surrounding environment. Some of the world’s rarest wildlife species are found only on these unique Indian Ocean islands. As one of the most unique marine conservation projects available, Wildlife ACT’s ecotourist activities include daily beach patrols to search for evidence of nesting sea turtles, assisting with the removal of coconut saplings and other invasive species, planting indigenous/endemic plants, collecting seeds, monitoring the White Eye population, Giant Aldabra Tortoise population and Hawksbill Sea Turtle population, taking care of babies if necessary, Terrapin trapping, and conducting snorkeling photo surveys in support of marine conservation. While conducting these activities with research staff and volunteers, participants gain a better understanding of the environment and the challenges faced by island conservation initiatives around the world. Seychelles Marine Conservation Project Activities. Monitoring of the Aldabra Giant Tortoise (Aldabrachelys gigantea) population and finding and recording GPS locations of tortoise locations for territory identification and movement patterns across the island. Digitalise the field fauna and flora database of North Island.